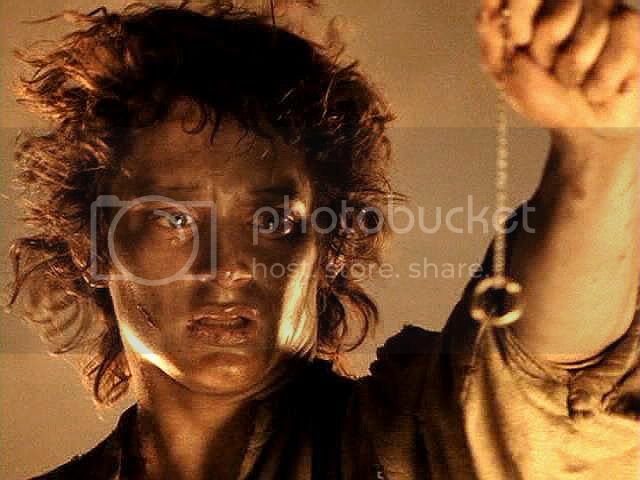 While I was writing my long essay for the introductory post ("Why I fell for Frodo in the Sammath Naur") I was also working on the posts for this series, in which there will be ten parts. I don't plan to talk at such great length in these, trying rather to let the texts and images, and jan-u-wine's poems, speak for themselves (although Jan's poems will not appear until Pt. 3). The Sammath Naur is a scene I decided to present in caps made from the fullscreen version. For those who missed the entry comparing fullscreen to widescreen, I've taken a pair of frames from that post to use as illustrations below. If you look carefully, you'll note that in the fullscreen version, while the image loses its sides, it gains the top and bottom of the frame originally shot, which is under the black bars visible in the widescreen screencap. 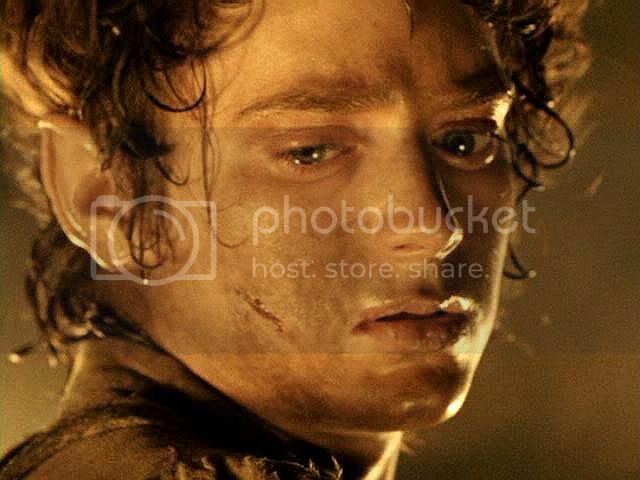 The black bars mask the top and bottom of the frame, effectively cropping the original camera frame, turning the standard widescreen format into the ultra-widescreen one used in LotR. Thus the fullscreen image ends up looking bigger, closer, and fuller. 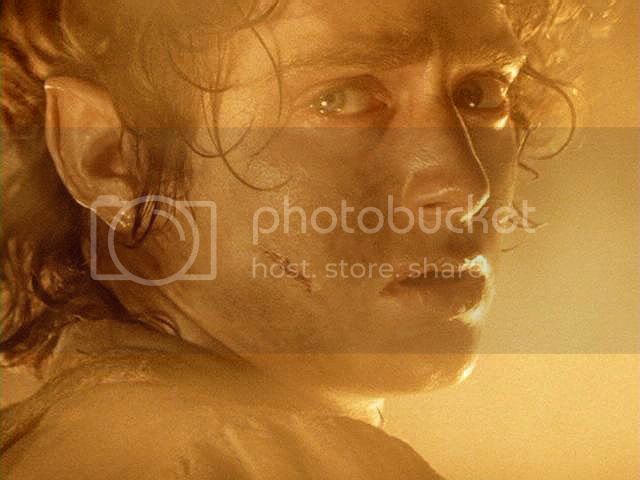 The widescreen format offers a much better sense of place, as can be seen in the two frames below that are shot from a distance, but, since the point of this series is to look at Frodo's face as closely as possible, to appreciate not only its beauty but its expressiveness, I thought fullscreen was the better choice. 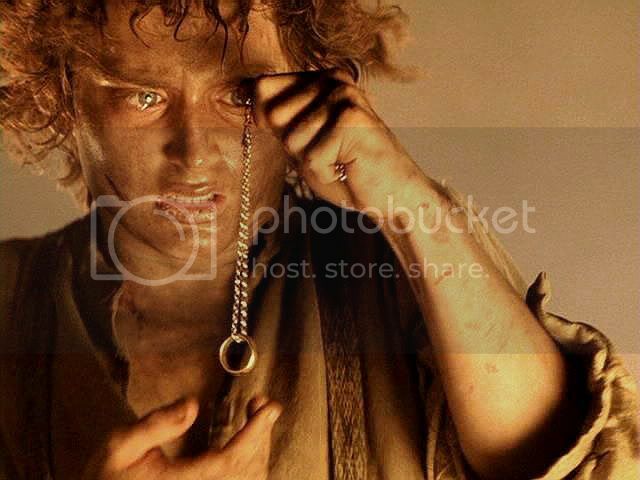 For an extended comparison between fullscreen and widescreen LotR formats, click here. Below is a book excerpt for the scene. I have so many caps, there is not enough book scene to go with each entry, so some entries will have no book text. The film script, too, consists of very few lines, so I have simply placed each line where it goes in the sequence of caps. Before I present the caps, I want to say how brilliantly I think they shot the opening of this scene. 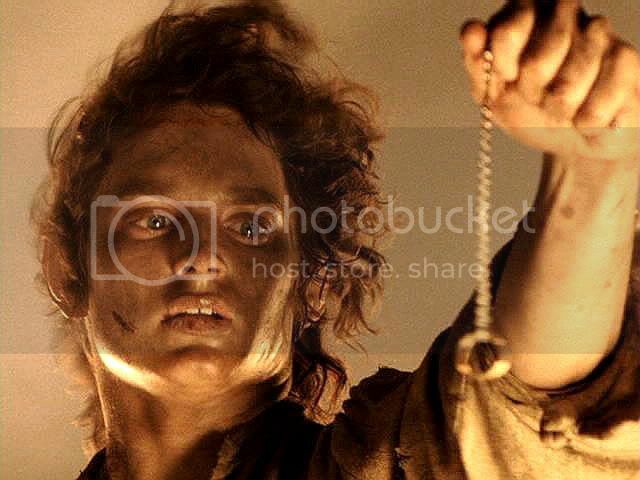 When Sam enters the Sammath Naur, the first we see of Frodo is a small, solitary shape; a still, indistinct figure standing in the midst of swirling clouds of steam. 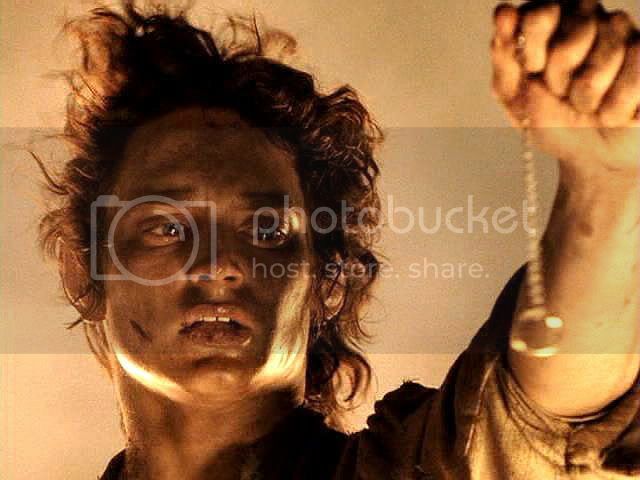 I think this image vividly portrays Frodo's inner state, and without using any words. 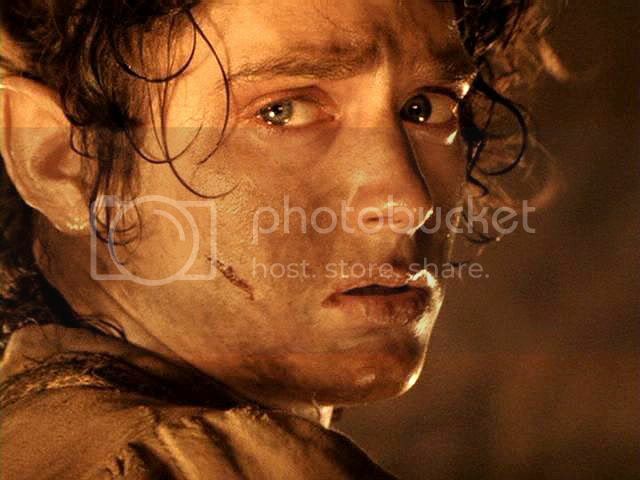 At the critical moment Frodo is alone, in crisis, his feelings unclear; and the forces he's facing are daunting. After Sam's reaction shot the camera pulls away, giving a view from high up (the Valar's eye-view?). Pull-away shots are done periodically throughout the sequence, to remind viewers of the setting, but also of the scale of what is happening internally for the characters. 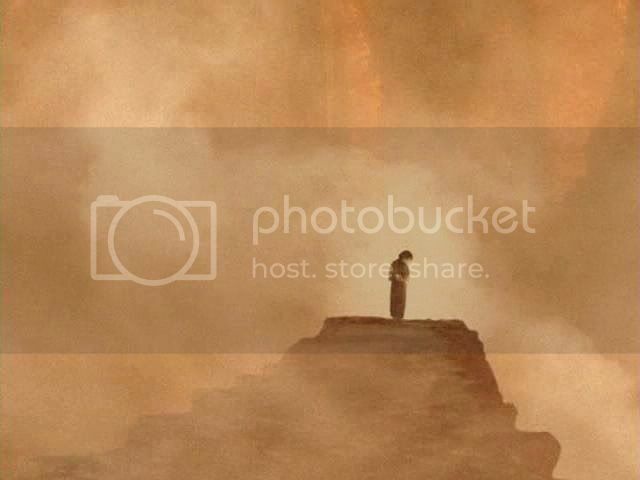 Frodo and Sam are two tiny, lone figures set in a vast, cataclysmic expanse. Even more brilliant, to me, is the way they make the pull-away shot say so much. 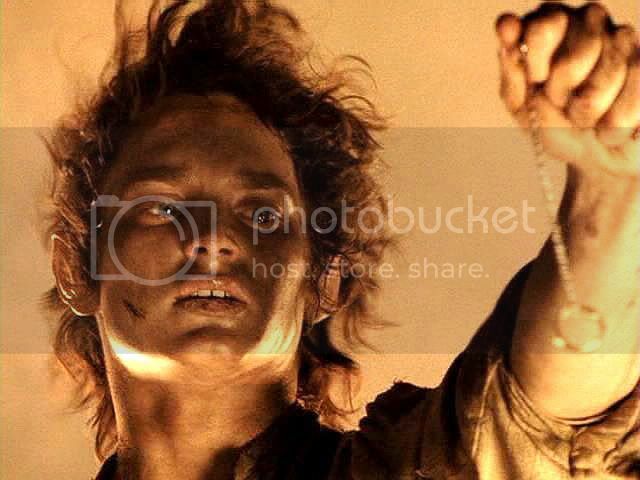 The tiny figure of Sam enters, the light from the outside world streaming in behind him (the light of truth? sanity? reality? ), its whiteness providing a contrast to the murk in the chamber, which it pierces. Sam's figure is small but distinct. 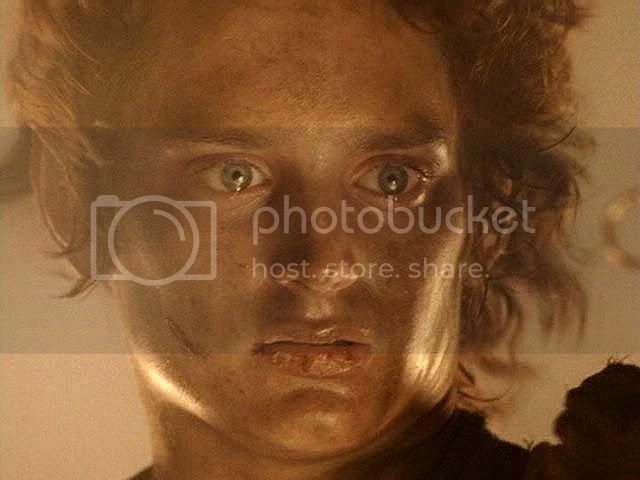 Frodo's figure, on the other hand, standing at the edge of the Crack of Doom, looks vague and gauzy, obscured by the mist and rising heat. 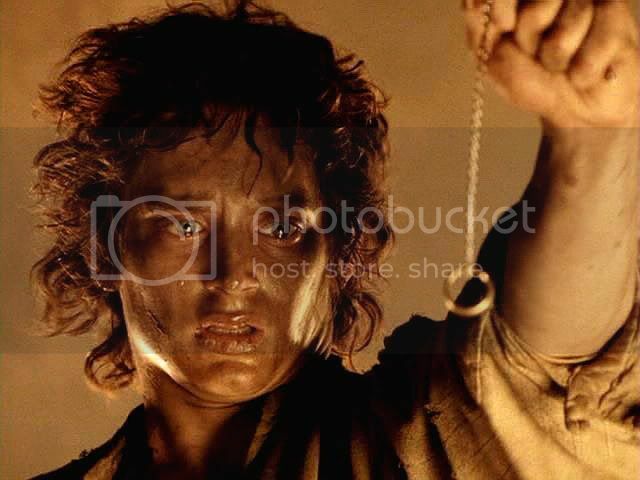 Ostensibly, Frodo stands on the brink of the abyss in order to cast in the Ring. 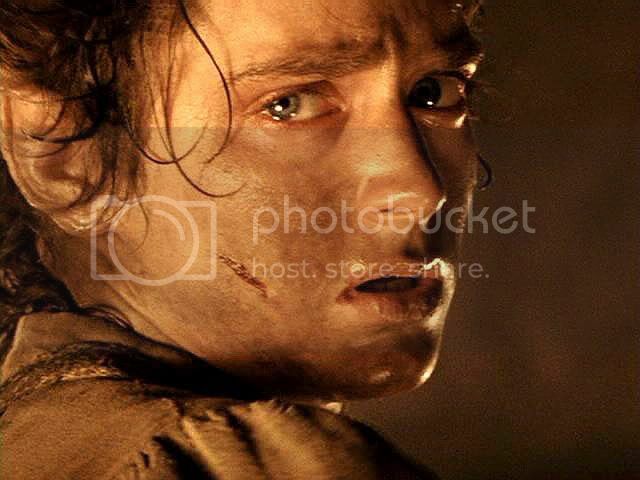 But the long shot gives the visual impression of Frodo as someone who is radically isolated, "out on a limb". 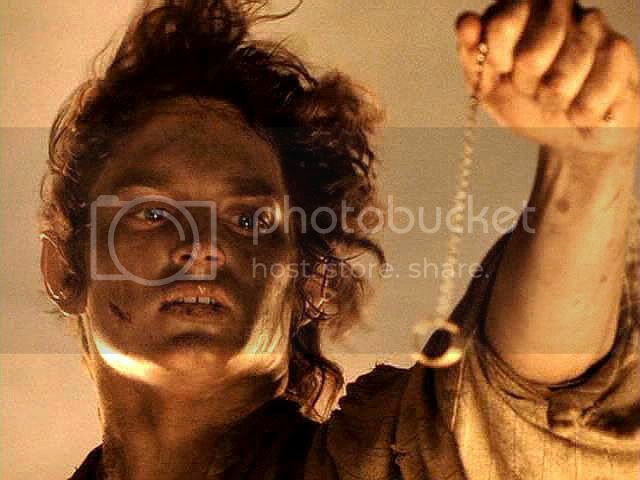 The impression is intensified by the way Sam, having pelted the rest of the way up the mountain and rushed in the entrance, stops, suddenly hesitant. 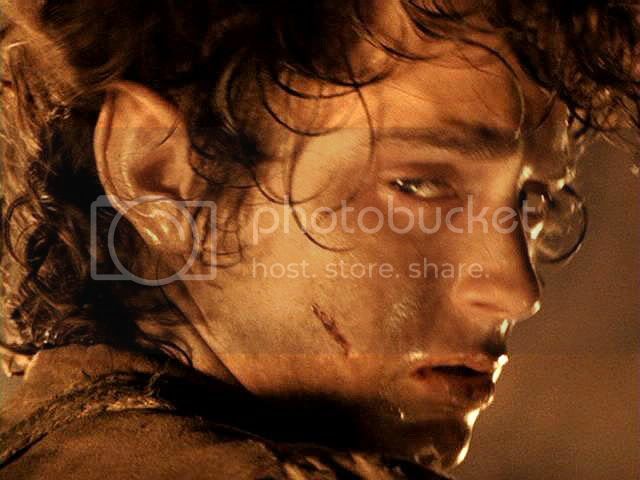 He can see at once that Frodo is in some sort of critical state internally, or he would have run right up to him. 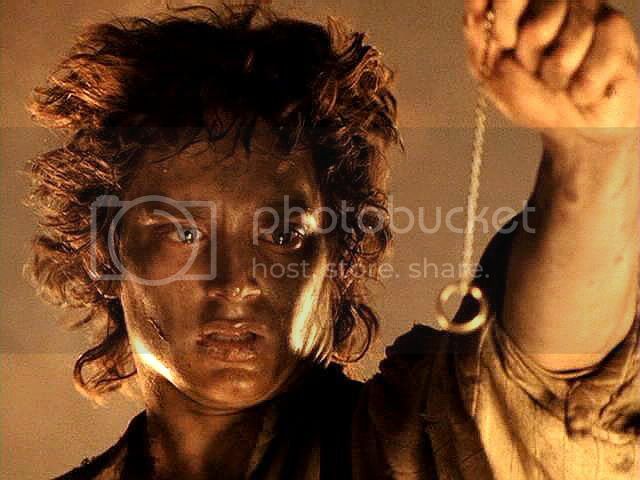 But Sam doesn't, he hangs back, like an emergency rescue worker who doesn't want to alarm a jumper. What a shot. 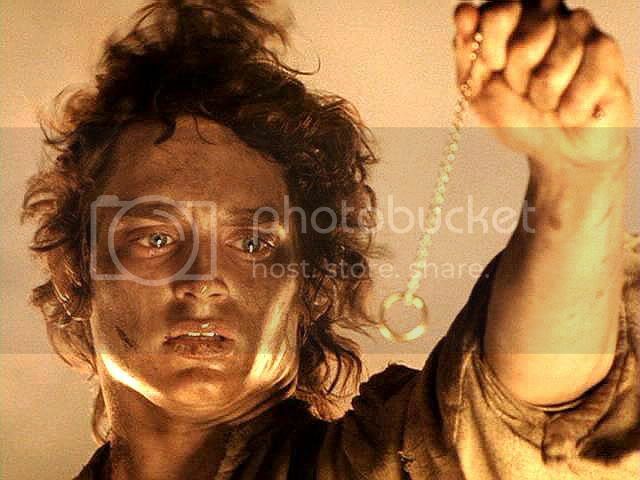 Although I didn't consider it during my viewings of the film, making the caps it struck me how potent this moment was, symbolically. 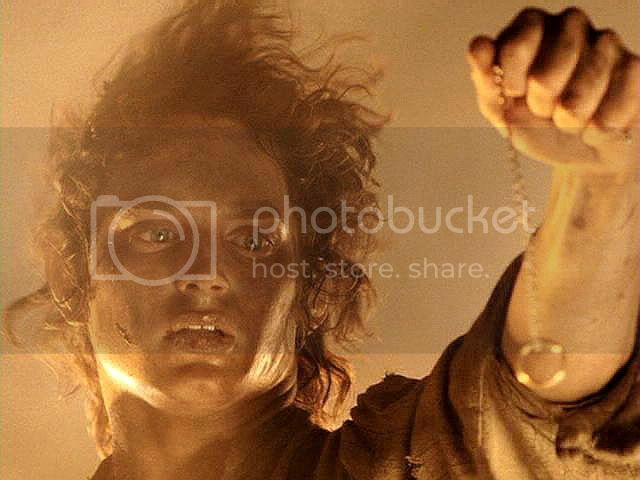 Sam, coming in from the light and reality outside, the world of clear choices, finds Frodo standing on the brink of doom, in the mist, in a spectral world half-hidden by the swirling vapours and jets of steam rising out of the pit of the Ring's beginnings. It's really a superb opening—done with no lines at all—establishing subliminally for the viewer what no dialogue could convey. 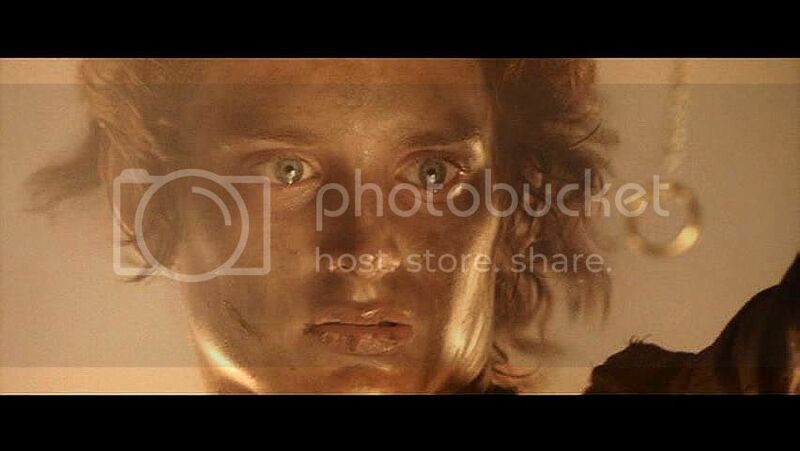 Book scene, from Mount Doom. At first he could see nothing. 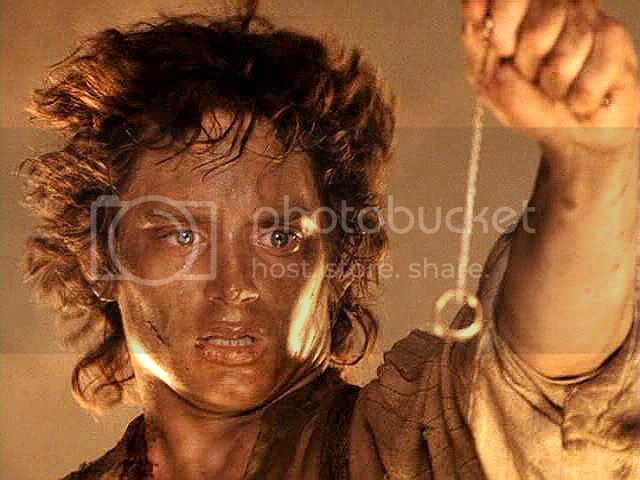 In his great need he drew out once more the phial of Galadriel, but it was pale and cold in his trembling hand and threw no light into that stifling dark. 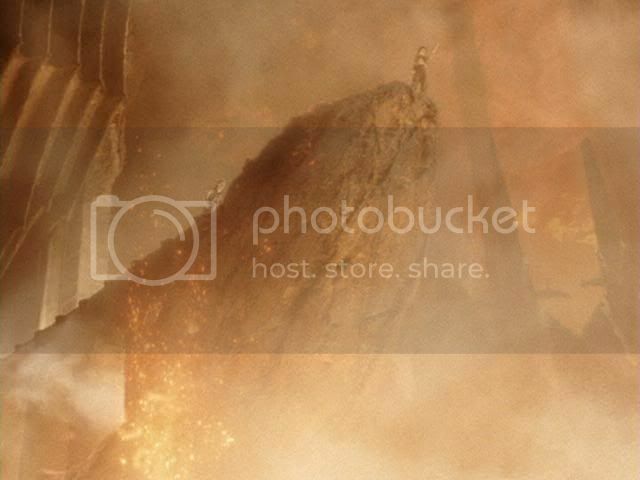 He was come to the heart of the realm of Sauron and the forges of his ancient might, greatest in Middle-earth; all other powers were here subdued. Fearfully he took a few uncertain steps in the dark, and then all at once there came a flash of red that leaped upward, and smote the nigh black roof. 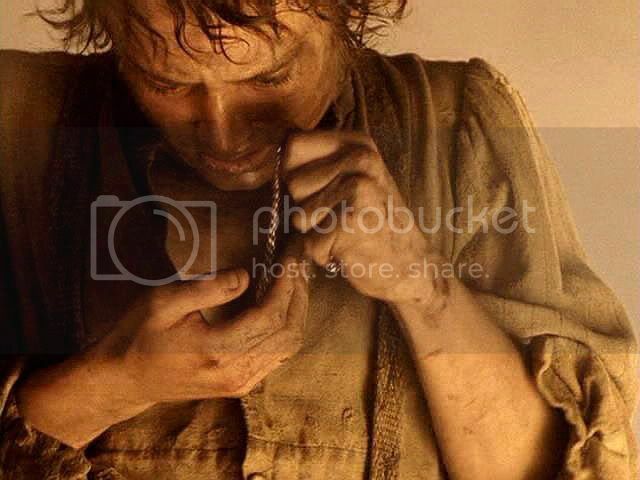 Then Sam saw that he was in a long cave or tunnel that bored into the Mountain’s smoking cone. But only a short way ahead its floor and the walls on either side were cloven by a great fissure, out of which the red glare came, no leaping up, now dying down into darkness; and all the while far below there was a rumour and a trouble as of great engines throbbing and labouring. Have you ever seen "The One Expression" page at T.G. 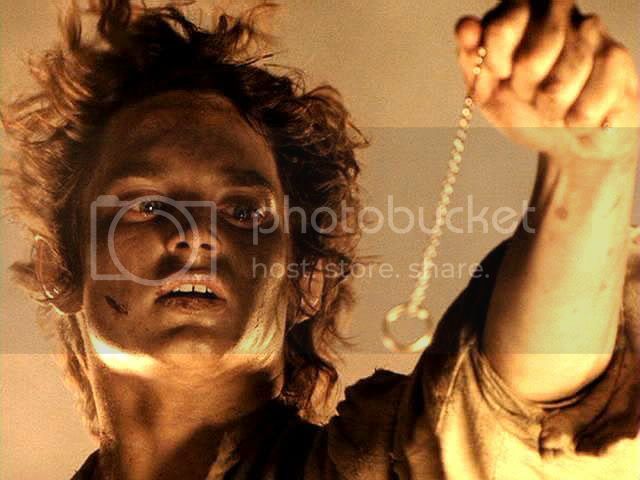 Shaw's site, "Frodo Lives-In Us"? It's GREAT. T.G. 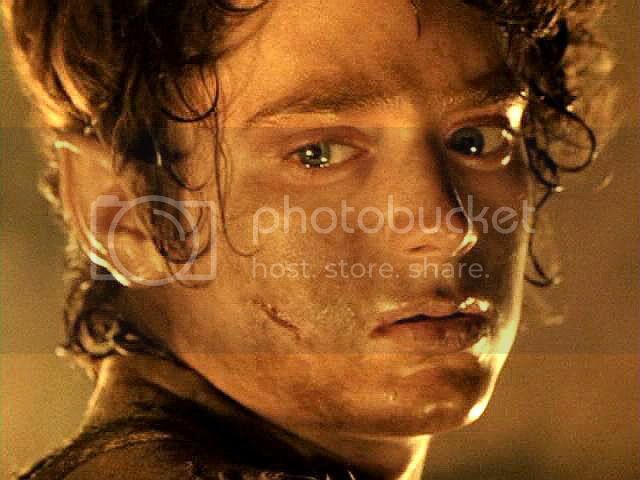 put together a collage of faces, loads of them, of EW as Frodo in the films, purposely to show how the range of his expression. If you haven't seen what she put together for this page, you should. It's great to produce as evidence to detractors, too. I "met" TG Shaw on a Tolkien message board, on a thread dedicated to the acting of EW. She's a very long-time Tolkien fan, deeply knowledgeable in LotR and most of his works, and a huge fan of EW as an actor. 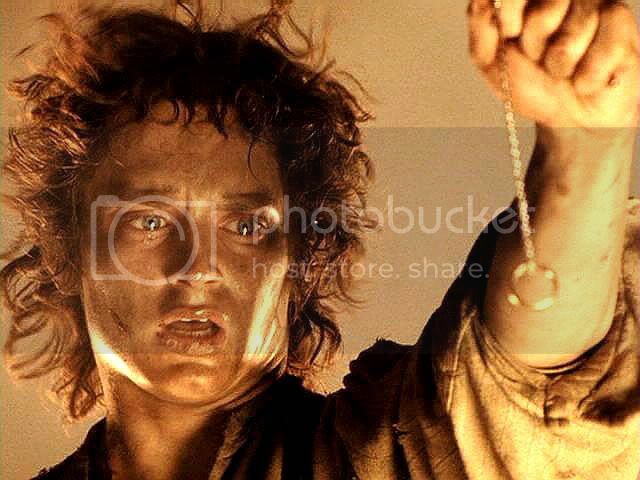 She's not a swooner, though, for either EW or Frodo. Or if she is, she purposely keeps it to herself. 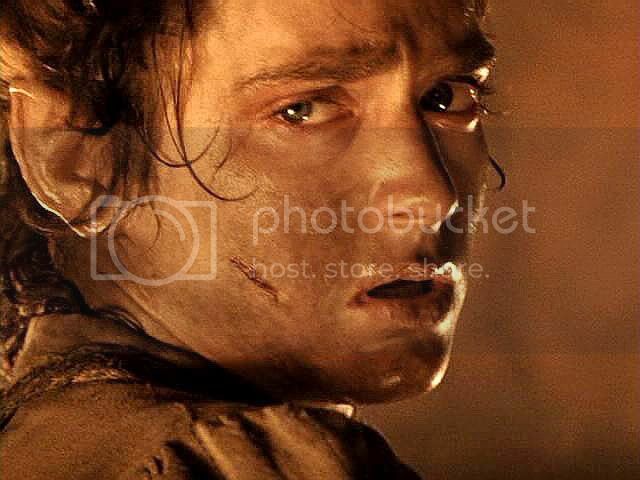 On her site are a lot of good essays about Frodo and LotR, and screencaps, but her main project is the study of EW's acting, through the examination of screencaps from his films. That's more EW than I'm interested in. 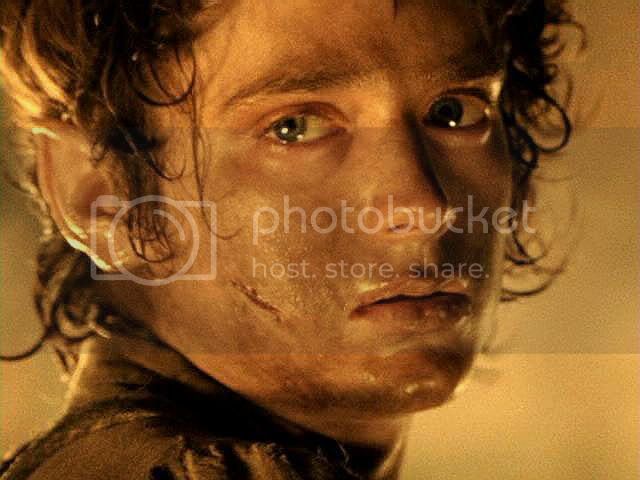 It's funny that I ended up making a huge screencap project of my own, but I screencap the films to contemplate Frodo, not EW's acting per se. But it's an indirect compliment to EW that I am so convinced by his portrayal I almost never think of the caps as pictures of EW, but only of Frodo. I agree, he was *stupendous* in this scene. So was Sean Astin, actually, even if his was only the supporting role. 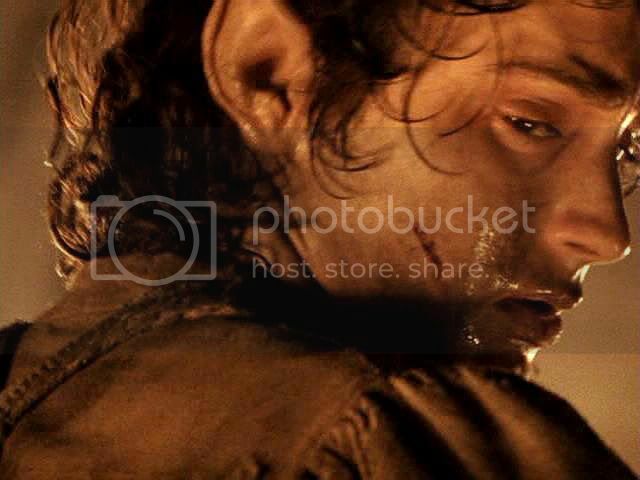 (I gave Gollum an Oscar in it too). Greetings, I am saving all these screencaps to my flash drive for later wallowing and contemplation and reading your essays that I have right now just glanced it and I could not access your main essay here even though I logged in. Don't know if it's the computer or me or what. Could you tell me how I can do that? This scene reminds me of that other one they didn't use that I think the limited edition gave you a glimpse of. 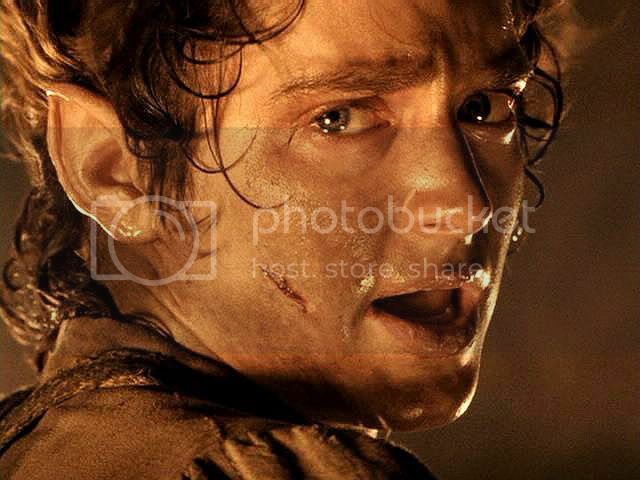 When Frodo is looking so lost and vulnerable and then he hears Sam's voice and looks up and his expression struck me like he is saying Oh good, Daddy's here, now I don't have to make all these grown-up decisions myself. 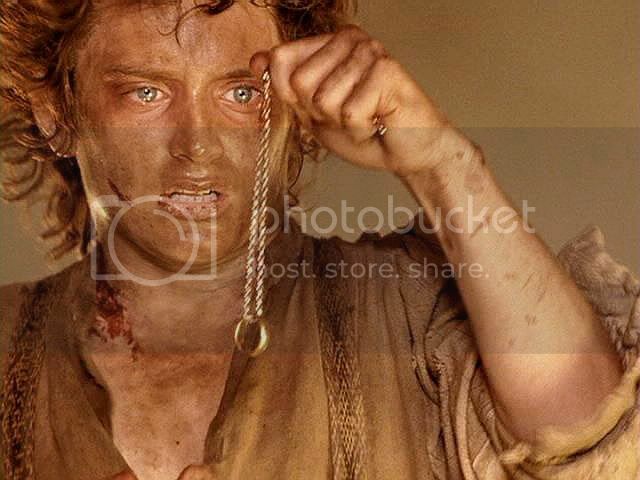 It was just so neat because in some ways Frodo did become Sam's child (as well as master, best friend, brother, everything but a lover). 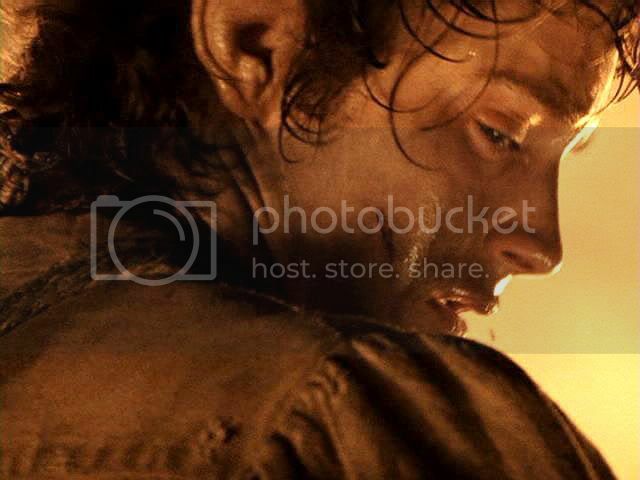 This makes me think of Sam's carrying of Frodo up Mt. Doom in the book. 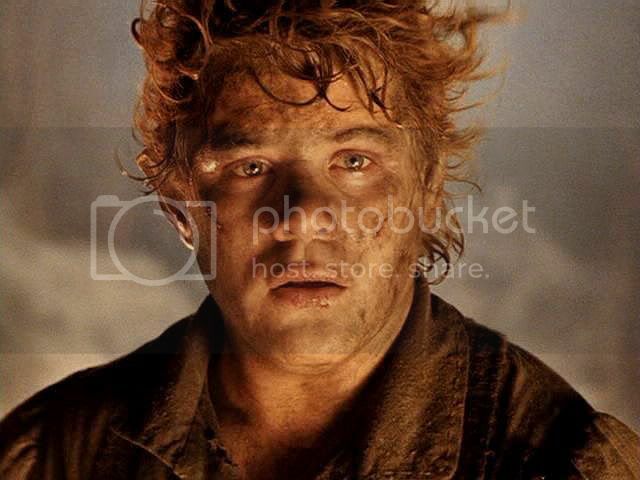 Not the film's fireman-carry, but "pig-a-back", saying with surprise that Frodo weighs no more than a hobbit child. I still can't get in after friending you. Help! Le hannon. I would love to read the essay mentioned above, there is only a message that I do not have access to this page. Has it been deleted? At this point, my posts are so infrequent I don't think I need worry about people reading personal material anymore. If you would like, let me know, and you won't have to friend this LJ if you really want to read it. I could unlock that entry for the day. Would that suit? I have already friended your account, so I do not think it would be a problem. Maybe it would be possible to get this article in an e-mail if I sent you a private message or something like that? I am quite new to Livejournal, I use it very rarely and I am not sure how it works. I'll include a link to the post in this comment. Otherwise you'll see that there's a string of related post links at the bottom of this entry, each with a little screencap image, which is the "button" to open the link. All the Sammath Naur posts are listed there for easy access. I always include links like that for what is related to the post one is reading. I also have pages of links to posts with little descriptions. These are reachable through links in the sidebar. 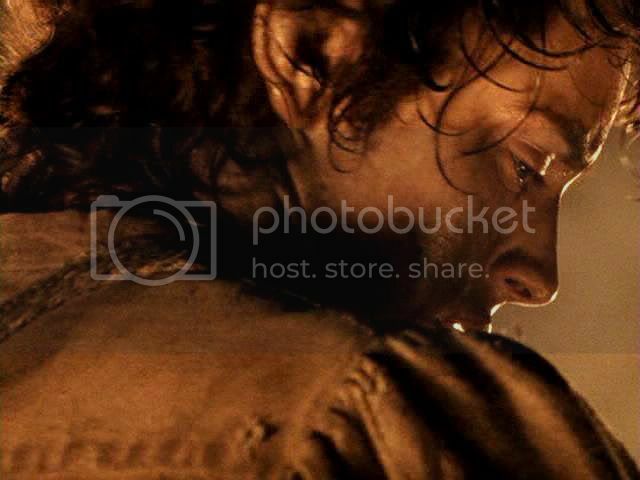 "Screencaps" - with links to caps, according to which film they're from, "Frodo Art Manips", which are images I made from masterpieces of art featuring the face of Frodo, sometimes accompanied by jan-u-wine's poems, and a page listing and linking all of jan-u-wine's poems in this LJ, with little images to show which images the poems go with. The link does not work, all that I get is the "Access denied" message. Huh! I'm going to log out and see what happens when I try to open it anonymously. I logged out, making me an LJ anonymous viewer, and I got a page that said I needed to log in, not "access denied". Very strange. Otherwise, logged in, I see it just fine. Tell you what (sorry this is being such a nuisance for you): I've just changed the setting for the piece to "public". It should be openable by anyone now. See if that works. Otherwise I'll send you the Word document I used to post the entry. It looks funky, with all the html codes typed out for the formatting, which is why I wanted you to be able to read it in situ.